← Probe Into Ireland’s First ‘6-Star Hotel’. In Greencastle. Hugo Duncan Leaves Big Brother House Successfully Without Detection. Family Worried. Hugo Duncan’s elaborate plan to evade detection in the Celebrity Big Brother house has worked successfully after he was voted out by the public last night. 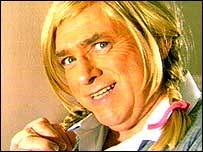 As we revealed weeks ago, the Man from Strabane entered the house under the radar, pretending to be a boxing promoter called Frank Maloney who had changed gender to become Kellie Maloney. The elaborately difficult strategy was pulled off to perfection with Hugo never once slipping back into skiddily dee mode or saying anything in a Strabanese accent. Strabane Borough Council have postponed their Welcome Back Kellie/Frank/Hugo party for the foreseeable future. Posted on September 6, 2014, in Strabane and tagged big brother, celebrity big brother, country music, frank maloney, hugo duncan, kellie maloney, London, Strabane. Bookmark the permalink. Leave a comment.